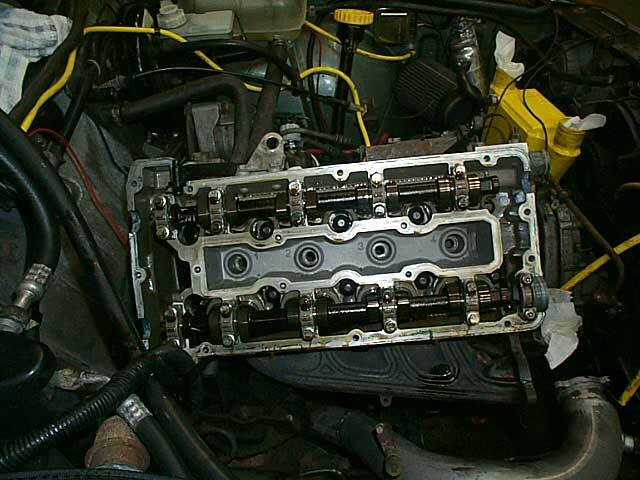 In order to ensure a good seal with the new gasket, you need to clean up the block and head to a nice smooth surface. Using a wire brush, you can remove the excess gasket material. Finish it off with some brake cleaner or laquer thinner. At this point it's a good idea to use a thread chaser and run it down the head bolt holes to make sure the threads are clean. This will make sure your torque readings are accurate. Since the exhaust manifold and cams were attached to the head, it was rather heavy. I had a friend help me lift the head onto the block and onto the samll studs. I tried to use the wood dowels as Bentley suggested, but I found that they got into the way and I ended up throwing them across the garage! With two people, you can drop the head down straight and not worry about the dowels. Now it's time to tighten it down. I choose to use the old bolts. Bentley recommends that you use new head bolts because the bolts stretch and then lose their ability to hold the torque. I measured mine and the length was within 1 mm of each other, so I reused them. Use the Bently book for the tightening sequence. Basically, you start from the center and work your way to the ends in a circle pattern. You may want to put some lube on the bolts to make sure they do not bind in the holes, however you want to be careful that the oil is not to slick. It can throw off your torque readings! Bentley doesn't say anything about oiling the bolts, so it's up to you! Turning the bolts the additional 90 degrees was surprising difficult! I was afraid that I would break either the 3/8" E-16 socket or the 3/8"->1/2" converter. After this first job, I have since bought a 1/2" E-16 socket to make sure I can really torque down the bolts without any worries.